Curio, the French Quarter’s newest and most exciting dining venue, is fast becoming a favorite for both visitors and residents alike. Whether by good reviews, whispers among friends, so Curio doesn’t get too busy for locals to get a reservation, or just passing by don’t miss a trip to this fantastic, new, and truly entertaining dining spot! The main attraction for Curio’s instant success lies in the distinctive talent and creativity of Executive Chef Haley Vanvleet, French Quarterly’s featured chef for 2018’s first quarter. Chef Hayley, who grew up in Illinois, attended Le Cordon Bleu Culinary Arts Program at Brown College in Minnesota. After her graduation, she worked in several restaurants in Minnesota and Seattle, Washington, gathering experience at every station in the kitchen. After Chef Haley moved to New Orleans, she found her initial job at Meauxbar Bistro in the French Quarter. It didn’t take long – all of four months -- before she was promoted to the top kitchen lead. Next, Chef Haley was offered a position at the soon-to-be renowned Peche Seafood Grill as Oyster Bar Chef. Hayley’s exceptional work ethic and dedication led to greater responsibilities as daytime sauté cook. Hayley was a Peche team member when the restaurant won the prestigious, national James Beard Award for Best New Restaurant in 2014. Peche owners and Chefs Donald Link and Stephen Stryjewski noted Haley’s abundant talents and offered her a position at Butcher, another Link- Stryjewski eatery, in January 2015. At Butcher, Hayley gleaned her skills and gained more knowledge about meat production, sausages, and charcuterie, along with management and restaurant operations. In the fall of 2016, the owners of Creole Cuisine Restaurant Concepts brought Hayley in as sous chef at Kingfish Kitchen and Cocktails. 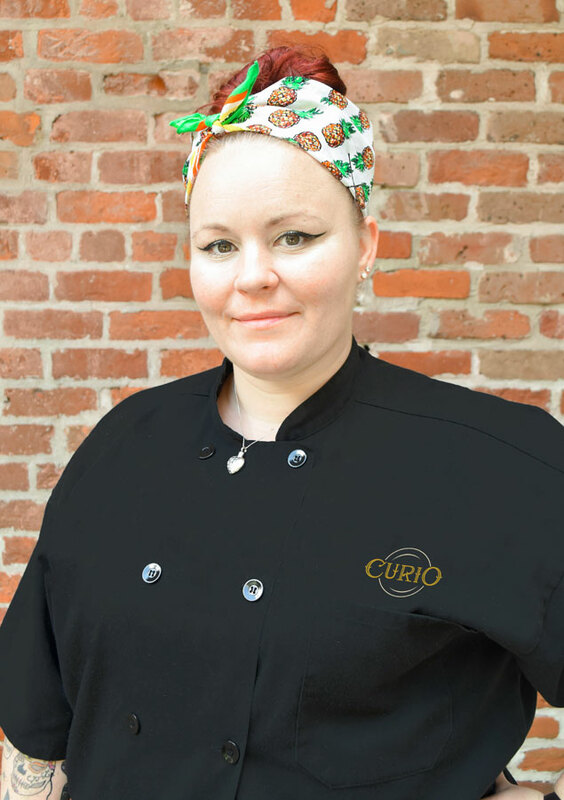 Her enthusiasm, leadership, and creativity were apparent, and soon the opportunity arose for Haley to be offered the top position as executive chef at the Creole Cuisine Concept’s newest French Quarter establishment, Curio. Since then, it’s all been gravy! Welcome to Curio, Executive Chef Haley Vanvleet, and all your admiring patrons!